Figure 12: Transverse section of the middle anterior abdominal wall above the arcuate line. This depicts the position of the Tuohy needle and catheter for local anaesthetic injection when performing a rectus sheath block. Courtesy of Webster 2010 (1). 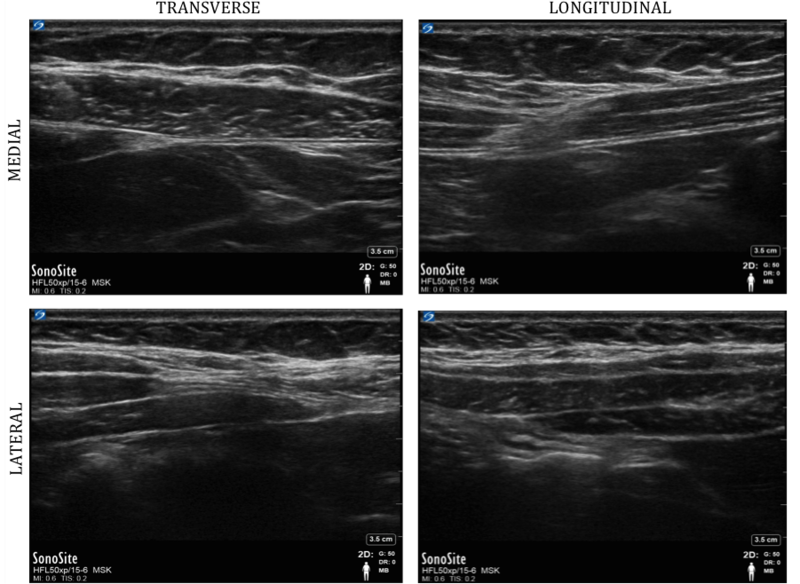 Figure 13: An ultrasound image of the anterior abdominal wall in longitudinal section, paramedian to the midline, with correct placement of the local anesthetic on the right. 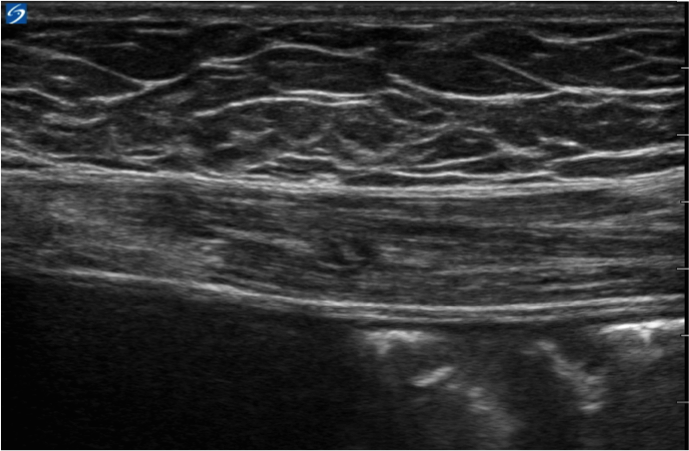 Note the hyperechoic twin tram lines formed by the posterior rectus sheath and the transversalis fascia. Preparation for this block and the placement of catheters is as for any regional procedure, the requirements of which are outlined in the ANZCA Professional Document PS03 ‘Guidelines for the Management of Major Regional Analgesia’ (6). The placement of catheters requires a sterile approach, with the provision of a sterile field, gown, gloves, mask and hat. Also prepare two 30ml syringes with saline, and two 30ml syringes each with 20ml of 0.375% ropivacaine. These are given to your assistant to inject. We recommend the use of saline to help identify and open up the appropriate plane prior to catheter introduction. Once the catheter is placed, local anaesthetic is injected under direct vision to confirm optimal catheter positioning. A 50mm 5-12MHz linear array probe provides optimal imaging of the posterior rectus sheath, usually at a depth of 4-6cm. 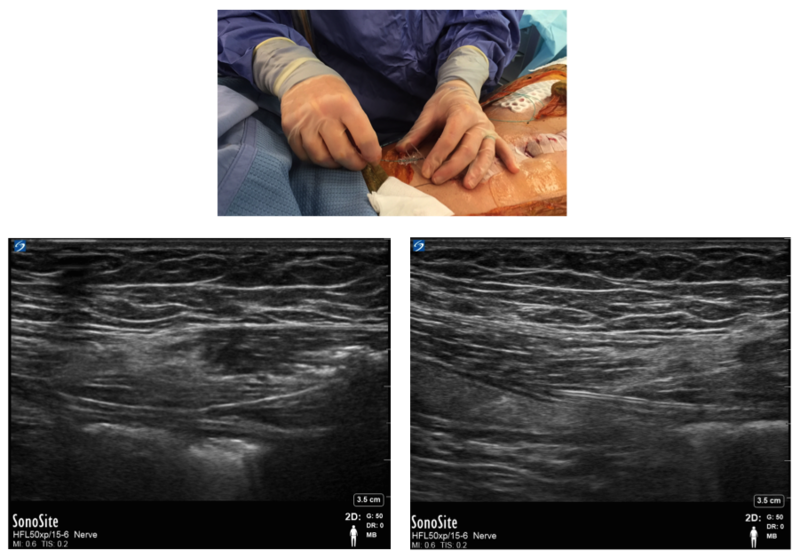 With the technique we describe (1, 4), place the ultrasound machine on the side of the patient that is the same as the proceduralist’s dominant hand. The proceduralist then stands on the opposite side of the patient facing the ultrasound machine. Prepare the tuohy needle by connecting it to the tubing extension. Hand off the other end of the extension to an assistant to flush through with saline. This prevents the injection of air, which will distort the ultrasound image. First identify the rectus muscle with the probe in the transverse plane, a few centimetres off midline and cephalad to the umbilicus. Then turn the probe to image the rectus muscle in the longitudinal position (as in figure 16). Align the probe as lateral as possible without the presence of the transversus abdominis deep to the rectus muscle. This allows for positioning of the needle and catheters as remote as possible from the surgical field, in closest proximity to the nerves before they enter the muscle belly, and with reduced risk of inadvertent vascular puncture of the more medially running epigastric vessels (4). Figure 15: Ultrasound imaging of the antero-lateral abdominal wall. Note medially there is no muscle deep to the rectus muscle. As the probe moves laterally the linea semilunaris, then the transversus abdominis, internal oblique and external oblique muscles are imaged. Insert the Tuohy needle cephalad and in plane with the ultrasound probe, just below the coastal margin, ~45o to the skin. Under direct vision advance the needle posterior to the rectus muscle and above the posterior sheath. 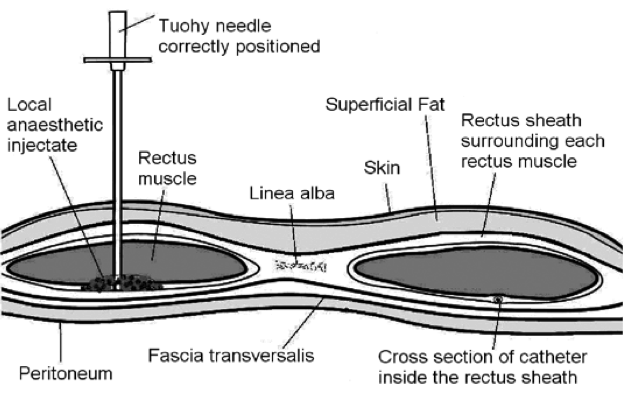 When in the correct plane, on injection of saline the rectus muscle should lift up from the sheath. Look for distortion of muscle to indicate the needle tip is too superficial, or for no movement which can indicate multiple things, including poor needle imaging, that the needle is too deep and intraperitoneal, or potentially intravascular. When in the correct position, inject ~10-15ml of saline and advance the needle tip a few centrimetres into the potential space created. This will help with introduction of the catheter. Then rest the ultrasound probe and proceed to inset the epidural catheter through the tuohy up to 15cm, being careful not to advance the needle. Then remove the tuohy needle and connect the epidural catheter connection and filter. Again hand this off carefully to the assistant to be ready to inject more saline to help position the catheter. Reimage the catheter and attempt to identify the catheter tip. Tip position is confirmed on injection of saline, with a characteristic initial flush of air, and then with further separation of the muscle from the posterior sheath. The catheter may need to be withdrawn a few centimetres, but aim to have at least 5cm of catheter in the space, usually leaving the catheter 12-15cm at the skin. The catheter should be clearly imaged on ultrasound in order to confirm its adequate positioning. Colour Doppler may help in identifying the turbulence of injectate. If this cannot be achieved then the procedure should be abandoned. 20ml of 0.375% ropivacaine can be injected once the catheter position is confirmed. With care not to pull the catheter out, remove excess gel and temporarily secure the catheter with steristrips. Repeat the procedure on the other side. Once both catheters are positioned, secure their position with Dermabond, Steristrips and Tegaderm. Aim to keep the dressings as lateral as possible on the abdomen to avoid interference with the surgical field. Then complete application of the surgical wound dressing, as per the surgeon’s request. Schleich first described the rectus sheath block to help relax the anterior abdominal wall in 1899 (7). With the advent of ultrasound and the ability to optimally place regional catheters, the rectus sheath block (RSB) has found greater utility in the provision of post-operative analgesia (1, 2, 4). A RSB provides analgesia over the middle anterior abdominal wall from the xiphoid process to the symphysis pubis. It is suitable for any midline (or paramedian) abdominal incision. The RSB is part of a multimodal pain package. It provides somatic abdominal wall analgesia only, with additional analgesia required for visceral pain (with oral or opiate PCA modalities as appropriate). • Studies are small and observational, with some studies being very limited and powered to merely look at differences of 10mg of morphine in a 24hour period. The sample population examined also has potential implications, with it being near impossible to show a benefit from RSC when the VAS pain scores in the saline placebo group that you are looking to improve upon are 1.8 (8). • The indication for surgery varies widely, with potential implications for the degree of visceral pain component. The use of variable types of incision is also a limiting factor, with incomplete coverage of the non-midline/paramedian incision. • The position of catheter is hugely variable, with inherent differences between those placed surgically (the predominant technique described in the literature) versus an anterior approach guided by ultrasound (see below for further discussion). Historically there has also been huge confusion in terms of what constitutes a rectus sheath block/catheter, with variable descriptions of catheters being placed subcutaneously, intramuscularly, or just superficial to the peritoneum. • There is significant variability in the dose, volume and frequency of local anaesthetic boluses, with potentially significant effects in terms of the 24hr opioid requirement. • The variability in control standards. Most studies have used saline as a control group, but this is proposed to have potential therapeutic effects related to the dilution of humoral factors that are implicated in the mechanism of post-operative pain. While epidural is widely considered the gold standard technique for post-operative open abdominal surgery, it is not without complication or contraindication in certain patient populations. Godden et al propose that there is equivalence between ultrasound placed RSC and epidurals in terms of pain scores, opiate use and postoperative complications (lower respiratory tract infection, postoperative wound complications or anastomic leak) based on a three year retrospective case note review in 109 patients (85 with epidural, 24 with RSC) (9). This indicator is waiting substantiation with the first randomised control trial that is currently in progress, comparing RSC and epidurals in 132 patients (10). With the presence of the superior and inferior epigastric vessels in the posterior rectus sheath, there is the potential for intravascular injection, either at the time of placement, or with unintentional movement of the catheters subsequently. These vessels usually lie medial in the sheath, so more lateral positioning of the catheter may reduce the risk of vessel puncture. Deep positioning of the needle and catheter not only risks a failed block, but also a puncture of the posterior rectus sheath, peritoneum and bowel. While there are no case reports of this complication in the literature, the theoretical risk demands the use of an in-line needle imaging technique and close attention to final needle and catheter positioning. The infectious risks of RSC is yet to be defined. While they are likely to be more common than epidural infectious complications, the implications of infection are less extreme. The risk is minimized with the use of strict sterile technique at the time of insertion, the use of injection filters and strict hand hygiene practice when accessing the injection port. Certain local anaesthetics such as Bupivacaine and Lignocaine are noted to have antimicrobial and antifungal activity (11). Limiting the number of manual intermittent boluses is important to consider, but permanent connection of a sterile system obviously has implications for mobility. Limiting duration of placement is also an important factor. While some studies report placement for up to seven (9) and four (12) days without complication, most studies limit use to 48 hours. The risk of drug error relates to injection of the wrong solution down the RSC, or the administration of local anaesthetic via the wrong route. This is again limited with the permanent connection of an infusion system that can give intermittent boluses. 1. Webster K. Ultrasound guided rectus sheath block – analgesia for abdominal surgery. Update in Anaesthesia. 2010;26:12-7. 2. Khorgami Z, Shoar S, Hosseini Araghi N, Mollahosseini F, Nasiri S, Ghaffari MH, et al. Randomized clinical trial of subcutaneous versus interfascial bupivacaine for pain control after midline laparotomy. The British journal of surgery. 2013;100(6):743-8. 3. Cornish P, Deacon A. Rectus sheath catheters for continuous analgesia after upper abdominal surgery. ANZ journal of surgery. 2007;77(1-2):84. 4. Sandeman DJ, Dilley AV. 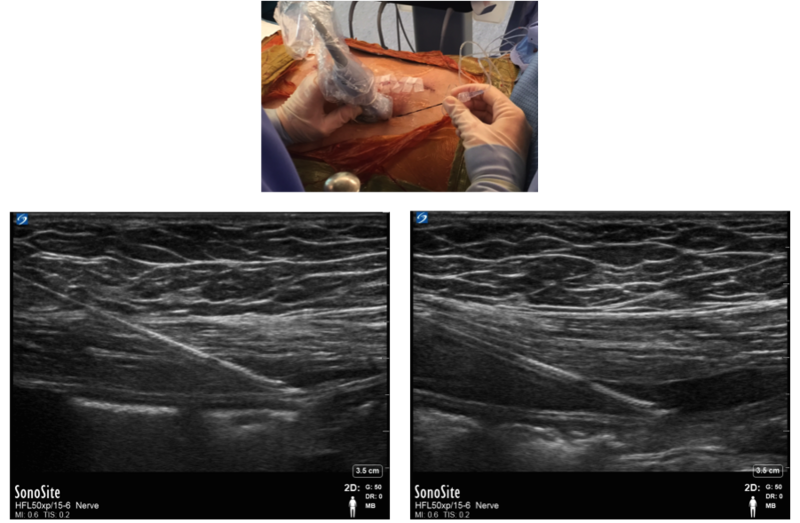 Ultrasound-guided rectus sheath block and catheter placement. ANZ journal of surgery. 2008;78(7):621-3. 5. Hebbard PD, Barrington MJ, Vasey C. Ultrasound-guided continuous oblique subcostal transversus abdominis plane blockade: description of anatomy and clinical technique. Regional anesthesia and pain medicine. 2010;35(5):436-41. 6. Australia New Zealand College of Anaesthetists. Guidelines for the Management of Major Regional Analgesia. Australia New Zealand College of Anaesthetists; 2011. p.
7. Schleich C. Schmerzlose Operationen. Berlin: Spinger; 1899. 8. Padmanabhan J, Rohatgi A, Niaz A, Chojnowska E, Baig K, Woods WG. Does rectus sheath infusion of bupivacaine reduce postoperative opioid requirement? Annals of the Royal College of Surgeons of England. 2007;89(3):229-32. 9. Godden AR, Marshall MJ, Grice AS, Daniels IR. Ultrasonography guided rectus sheath catheters versus epidural analgesia for open colorectal cancer surgery in a single centre. Annals of the Royal College of Surgeons of England. 2013;95(8):591-4. 10. Wilkinson KM, Krige A, Brearley SG, Lane S, Scott M, Gordon AC, et al. 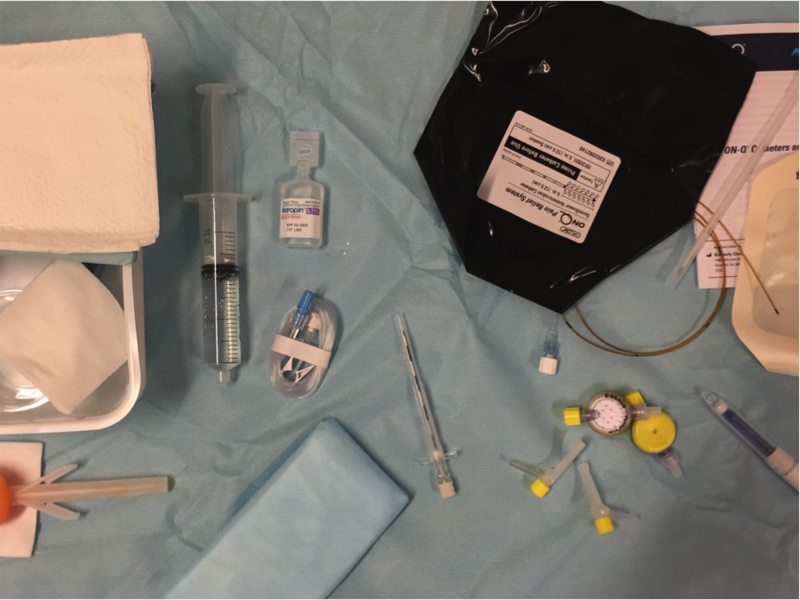 Thoracic Epidural analgesia versus Rectus Sheath Catheters for open midline incisions in major abdominal surgery within an enhanced recovery programme (TERSC): study protocol for a randomised controlled trial. Trials. 2014;15:400. 11. Johnson SM, Saint John BE, Dine AP. Local anesthetics as antimicrobial agents: a review. Surgical infections. 2008;9(2):205-13. 12. McDermott F WJ, Doorman P. Surgically placed rectus sheath catheters. Update in Anaesthesia. 2010;26:9-11.